"There are no more committed people on the planet than surfers. We fall down a lot. We turn around, paddle back out, and do it over and over again. 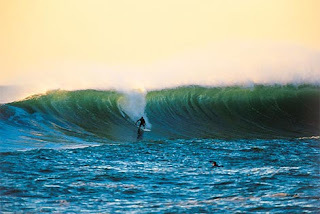 Unlike anything else in life, the stoke of surfing is so high that the failures quickly fade from memory." Menakoz, bathed in atypical light and looking unusually alluring. Don't be fooled. This place has teeth.